BANGOR – Millinocket native Peter Kelleher lost his son, Travis, in a 2016 drug overdose in Bangor, and since then has been working to help those who live on the streets. Kelleher started making soup for homeless people after his son’s death. 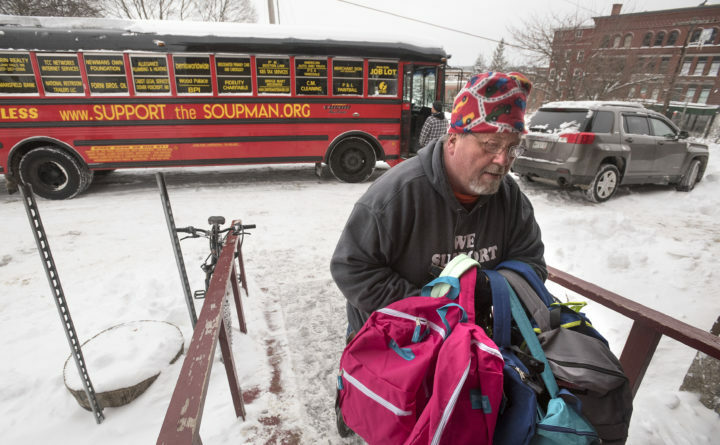 The Massachusetts resident is now known as “The Soupman” and was in Maine handing out backpacks filled with basic items, and buying boots for those who live on the streets. “It’s absolutely an extension of our mission,” he added later. “Thank you, thank you, thank you,” is how Shaw House case manager Suzanne Flood reacted when Kelleher stopped his big red bus outside the teen shelter’s side door. Danielle Webb, a Bangor area transient, was on the bus. Webb was one of four locals picked up by The Soupman for a trip to Walmart to get a new boots, her first new pair in around five years. After leaving the shelter, the bus made its way to the Union Street Brick Church. BANGOR – A Millinocket native who now lives in Massachusetts and is known as “The Soupman” is back in Maine to give out backpacks filled with items for the homeless. Peter Kelleher lost an adult son to drug addiction during 2016 in Bangor. While grieving, he began making soup and giving it away to homeless people … just like his son. That is how “The Soupman” was born. On this trip to Maine, he’s not making soup, he’s giving out backpacks filled with toiletries, gloves, hats and hand warmers. And he’s working on adding a portable shower for people in Bangor. Kelleher travels from city to city, serving meals to the homeless, along with handing out gloves, hats, coats and other items. But he’s famous for his soup. A year ago, Kelleher started the nonprofit Support the Soupman. His latest project involves purchasing portable shower trailers for the homeless. Kelleher began helping the homeless after his son, Travis, died of an overdose years ago. For him, it was a way for him to ease the pain. Each portable shower Kelleher buys costs about $50,000. He hopes sales from his famous soup, among other things, will help fund many more. The Soup Man, also known as Peter Kelleher of Bridgewater, delivers homemade soup and care packages of clothing, winter items and toiletries to homeless people each weekend. He does this in memory of his son, Travis, who was homeless and died of a drug overdose, at age 32, in 2016. BRIDGEWATER – Charlotte Stevens saw homeless people huddled on the roadside as she drove through Brockton, and thought of her brother. Arthur “Joey” Myatt III, Stevens’ brother, had been homeless, abused alcohol and drugs and died in 2014 when he was trying to cross the street, intoxicated, and was struck by a car. Stevens knew she wanted to help people in her brother’s memory. So she picked up her crochet needles and began to creates scarves and hats. Wanting to donate them to homeless people in Brockton, she searched online for the proper avenue when she came across an article about a “Soup Man.” The Soup Man, also known as Peter Kelleher of Bridgewater, delivers homemade soup and care packages of clothing, winter items and toiletries to homeless people in Brockton each weekend. He does this in memory of his son, Travis Kelleher, who was homeless and died of a drug overdose, at 32, in 2016. Touched by his story, Stevens frequently drops off her crocheted items to the Soup Man. She is not alone. Hundreds of others, both locally and across the country, have read the Soup Man’s and reached out to him. Kelleher’s one man show has quickly become a project with dozens of helpers — and it continues to grow. Peter Kelleher delivers backpacks full of supplies to Manna Ministries at the Union Street Brick Church in Bangor. He was in Bangor on Wednesday, where his son died of a drug overdose in 2016. Kelleher is from Maine, but now lives in Bridgewater, Massachusetts, where his organization Support the Soupman is based. 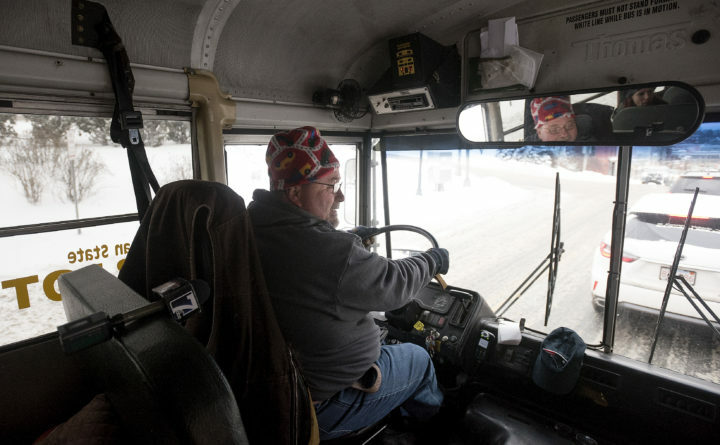 Peter Kelleher drives his bus from the Bangor Area Homeless Shelter to Manna Ministries at the Union Street Brick Church in Bangor to deliver backpacks full of supplies. He came to Bangor, where his son died of a drug overdose in 2016. Kelleher is from Maine, but now lives in Bridgewater, Massachusetts, where he runs a charity organization called Support the Soupman. Peter Kelleher returned to Bangor on Wednesday to make something of the grief he’s felt ever since his son died of a drug overdose here two-and-a-half years ago. All morning, Kelleher, a Millinocket native who now lives in Bridgewater, Massachusetts, drove around downtown Bangor in a red school bus, stopping at various places to donate backpacks filled with toiletries and other supplies to the poor and homeless. Despite the snow that was falling, he left about 75 backpacks at the Hope House and 50 at the Bangor Area Homeless Shelter. He dropped some more off at the Union Street Brick Church before going to purchase winter boots to distribute. Each pack contained toothpaste, chapstick and other essentials. Many also contained menstrual products, which are costly — often unaffordable for those with limited means. Kelleher also planned to hand out backpacks to any other homeless people he spotted while driving through Bangor.